Michael Ginsberg of 3Gstore.com was on the receiving end of 2 random acts of kindness this past week. When a friend posted that she also had received a random act of kindness and was looking to find out who did the deed so that she can “Pay It Forward”. The next day, Michael had an idea. Since, he lived in Cary, Illinois. 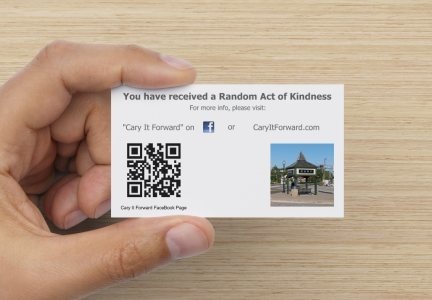 Instead of paying it forward, we should “Cary It Forward”. Michael started a FaceBook page called Cary It Forward and started a web site called CaryItForward.com on Monday (2/17/2014). He ordered some “business cards” so that others could do a random act of kindness and drop off a card to the person on the receiving end. Word quickly spread in Cary and four days later, over 400 people had liked the Facebook page. You can pickup the free cards at 3Gstore.com or Cary Chamber of Commerce and there should be more Cary businesses supporting this soon. It should be fun to see where this goes, as there are so many giving people in this community.